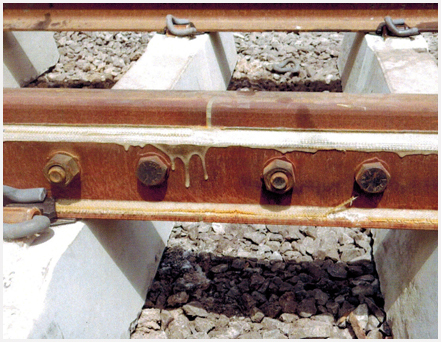 Glued Insulated Rail Joints are used on rail track circuited area. These Joints are used for insulation in the long welded rails and points & crossings and are similar to conventional rails in their mechanics. Glued Joints are assembled in the factory using two specially rolled solid Web fit type of fish plates of requisite length by using high strength adhesive. Insulating liners, bushes, HTS bolts and end posts are provided to ensure adequate electrical insulation. All the Glued Joints are subject to international manufacturing and testing standards. Specified Pull out test, dry and wet insulation tests, lateral and vertical alignment etc. are carried out before the despatch. Glued joints can be fabricated at site also as per the client's instructions. There are various advantages of fabrication of joints at site. No transportation of rails is required and the rail traffic can be opened after one hour. The insulation and pull out strength are reasonably within the acceptable ranges.